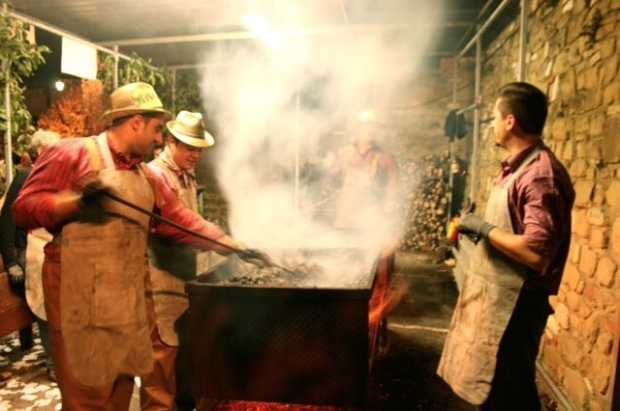 It’s now the winter in the Niccone Valley and at this time of year you often come across stalls selling roasted chestnuts in Italian town centers. October is the start of the chestnut season and in that month many of the local villages hold festivals dedicated to the castagna. The chestnut was once considered a poor man’s food because the trees only grow at high altitude – near to mountain communities who needed to supplement their diet with whatever was available. The numbers who attend the various Feste di Castagna are proof that the once humble chestnut is now popular with all sections of Italian society. The hill top village of Preggio above the Niccone Valley is the nearest chestnut festival to us, it is hugely popular and attracts crowds from far and wide, a park and ride system operates from the large car park below the village to cope with the numbers. Preggio is at 650 metres altitude and it can be already be quite cold by mid October, however, this year we were blessed with extremely mild temperatures. In fact, such is faith of the Preggese in the chestnut, that they all keep one in their pockets in order to ward off the common cold. One of my friends who lives nearby swears by this ancient folk remedy, I’m still waiting for him to come down with a cold but, no doubt, if he does, it will be because he lost his chestnut! Many of the houses in Preggio open their cellars for the duration of the festa and transformed into taverne serving food and wine. A piece of advice if you plan to eat there – the taverns get very full at 8pm so aim to get there a little earlier if you want to be sure of a seat. If you are not here in October but still want to eat castagne, the restaurant in Preggio, called of course, La Castagna, does a chestnut soup as its signature dish, it is one of several Restaurants In The Niccone Valley.